Two months ago, I quit the best job I ever had. At least, I’m sure that’s how it looks. Writing is one of those professions that automatically elicits people’s opinions about your work, and since quitting, I’ve encountered enough split-second pauses to develop a strong feeling that the decision makes me look either stupid, incompetent, or both. The supporting evidence is considerable. When I left, I had little to no nest-egg to live on. I had a few prospects, but nothing sustainable. Now I’m up to my ears in credit-card debt. I haven’t received a paycheck in weeks. I also can’t recall a time in my adult life when I’ve been happier. The perks of life as your own boss are as obvious as its downsides, but I don’t believe anyone really wants to be a freelancer, at least not at first. Upon graduating J-School in 2010, I had braced myself for the absence of job security, only to be saved by an unlikely staff position in the eleventh hour. Then, two years later—seven months into my second job—the magazine’s new owners cleaned house and my colleagues and I found ourselves unemployed. So I turned to freelancing as a transition, vowing to collect a little money until I could replace my old gig. After all, no benefits? No office or support system? Just slaving away, piecing together an adult-sized income a couple hundred bucks at a time? Who would want that kind of hell? Against all my expectations: me. Two and a half years after the layoff, I was still self-employed. I had good bylines, great relationships with supportive editors, and, most remarkably, a network of journalists who had my back, should I need additional help. I’d still been steadily interviewing, for more jobs than I can count now—but somehow each opportunity eventually disappeared, often for odd reasons, some of which I still don’t understand. In the meantime, I sometimes found myself actually enjoying working alone on my couch. I wasn’t making two dollars a word or anything, but I started earning a decent, mostly-consistent living after a while; at one point, I even got paid to write about freelancing itself. Each time a new writer emailed me for guidance, it felt like another confirmation of my success, a sign, even: I didn’t need a full-time gig anymore. 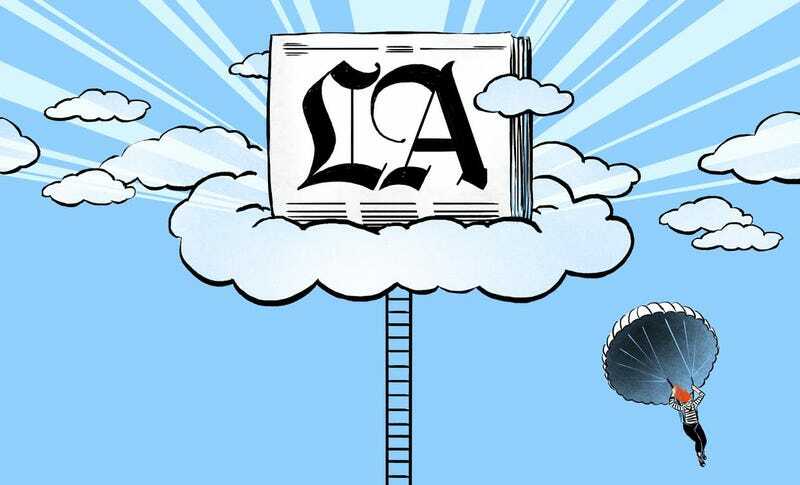 But then one of these evaporated jobs came back to life, and after a few more interviews (all of which, in total, ended up spanning nine months), the Los Angeles Times offered me a job. By any reasonable professional standard, it was a Great Job: The publication was impressive, it was a high-profile management position—pop music editor!—and it came with one of those unicorn salaries (plus benefits) to which most journalists rabidly aspire. The offer alone was enough to send anyone I told into shrieks of congratulations. So I accepted it. Sure, I felt steadyish on my own. But I knew how quickly freelance life can slide into panic about money and inescapable anxiety brought on by unpredictable checks. I remembered, when it was bad, the regular paralysis of despair—the pity parties I would throw, crying on the couch and clinging to my dog until he wriggled free of my smothering embrace, asking myself why nobody wanted me enough to put their faith in me as a full-time staffer. I remembered the antidepressants I had to start taking about 18 months into self-employment when suddenly I found myself missing deadlines because I couldn’t get out of bed in the morning. Freelancing, for the joy of independence it gives you, can be an impossibly lonely place. And big career moves are the point of it all, right? The Times really seemed to want me, so much that they offered a salary bump for a dog-walker when I expressed concern about leaving Oscar at home all day. It’s really, really hard to turn down a Great Job; it seems unthinkable to turn down a Great Job That Badly Needs You. Four months later, I was handing in my resignation letter. A bad job can make you feel immediately unhinged, and even more so when, on the surface, it looks so much like success. Of course, there were red flags: that nine-month interview process, for one; the fact that one of the oldest, most tumultuous journalistic bureaucracies in the nation hired a twenty-something female editor to manage an all-male, all-older and nearly all-white team should’ve been another. At least I know what I’m getting into, I’d reasoned. But seeing red flags, it turns out, is not the same as anticipating what dealing with those red flags will do to you. The next few months followed that pattern to the letter. In a series of events that’s probably familiar to young people in any industry, I was welcomed into the company for my digital expertise and energy, then given no resources, accommodations or support to actually put those assets to work. My emails would often be ignored or forgotten, my specific requests taken as suggestions, my questions laughed at in edit meetings. When I would ask for support with my staff, I was told I just needed to be “nicer” (a code word many women in management know all too well). Suddenly, all those supposedly manageable red flags metamorphosed into bloodsucking chupacabras, and before long, the full-time job I thought I wanted—thought I needed, and needed me—was turning me inside out and backwards more violently than freelancing ever had. I wracked my brain for weeks. I wouldn’t last; I couldn’t be a quitter. I was still getting brand-new congratulations, and to leave so quickly seemed mortifying. I wondered what people would think of me, if I’d ever get another job again, and more troublingly, if I wasn’t good enough to—if I wasn’t cut out for a staff position at all. I was swimming in doubt. Did every editor encounter this kind of pushback going into a legacy brand, or was it just me? Was I overreacting thinking my experience would have been different were I a white man? All I knew was that, in practice, my colleagues gave me no enthusiasm or positivity or even just trust in my leadership—no baseline benefit of the doubt. With no support system, I was immediately asked to prove to a section that was already downtrodden, and mismanaged and doubtful that I could turn everything around. Legacy institutions have a conflicted relationship to change. They need it, but fear it—particularly the uneven way it always comes. Newness feels like destabilization; innovation, even when it’s obviously necessary, feels like danger. Freelancing, which rewards adaptability above all else, had taught me entirely different. I loved being able to quickly prove my ideas had merit—to trust that, if one publication didn’t trust a pitch, another would. Part of what had made me a successful writer and editor was being flexible and being open. To see those qualities as irrelevant to the office, or even laughable, made me feel alien to myself. Everything felt wrong. I had (and still have) no idea how I was supposed to inspire stubborn, conservative people (dudes) to trust me, let alone change course. Maybe I really wasn’t management material (whatever that is). Maybe I’d changed too much as a freelancer. Anyone who runs their own business can tell you that working for yourself can dramatically change your approach to the very concept of work. Maybe I’d been spoiled for the real world by so much working from my couch, being able to do whatever I wanted for longer than I’d ever spent in a staff position. It felt clear then. Four months be damned. I’d rather be proud of my work than miserable. This decision put me at the height of privilege, of course. The impostor-syndrome-advocating life coach in the back of my head screaming “HAHA, you think you’re special? Everyone hates their jobs; you’re lucky yours looks good on paper. Deal with it” was enough to remind me of that. The fine print in the above epiphany is that I realized how lucky I was to be able to choose—to not have to stick it out in an unwinnable situation because I had to, like so many people do. I was too young to fake it, phone it in, get lazy, lose the ravenous hunger that everybody in this industry needs. I was fortunate enough to be able to act on that, and that was, in the end, the realization I needed to act. My answer for her was automatic. I had been in debt before; I know how it feels like you’re fluttering in the wind with no counterweights, like you could nosedive into the pavement at any moment. But after almost three years on my own, I also know how to dig myself out. And best of all, now I’m choosing it—not the other way around. Self-employment isn’t a storm to be weathered anymore. (The statistics prove it, even if I can’t, and with my industry’s retention rates, who’s to say I would have kept that job for much longer anyway?) Freelancing can be just as challenging and frustrating as any staff position that may come along (and I hope they still do after this essay is published), but it’s infinitely more reliable than a platonic “dream job” ideal that, in this industry, grows rarer by the hour. A dream job, I now think, may be literally that—a position that exists only in the imagination. For me, at least, it was always just a dream. Devon Maloney is a journalist and writer living in Los Angeles. Her work has appeared in Vanity Fair, New York magazine, WIRED, GQ, Grantland, Vice, Nylon, Out, Billboard, Pitchfork, MTV, the Village Voice and Spin.